I hope that my workshops fall into this category as well, with the guarantee that you will walk away having learned many useful, simple, and practical skills. At least one more event belongs on this list: the publication of a new book by Colin Ware. 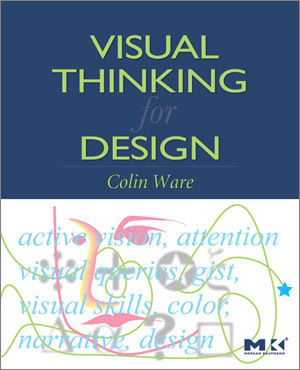 When Colin told me late last year via email that he had a new book on the way entitled Visual Thinking for Design, I began counting the days. As far as I know, Colin is the world’s leading authority on visual perception in terms of how our knowledge of its mechanics, strengths, and limitations can be applied to information visualization. Much of what I know about visual perception, I learned directly from his work. I’ve been relying on his book Information Visualization: Perception for Design for years, quoting it often in my own work. Based on its exceptional quality—not only its excellent content, but also Colin’s ability to express it clearly—I knew that the release of his new book would constitute a major information visualization event. I finally got my hands on a copy a couple of weeks ago. My high expectations were not disappointed. In fact, they were exceeded. Visual Thinking for Design is intentionally less comprehensive than Information Visualization: Perception for Design, for it is more focused on visual perception as a process that can be tapped to help us think more effectively. This new book is also accessible to a broader audience of readers. Anyone interested in how visualizations should be designed—both the pictures and interactions with them—to help people discover and understand the meanings that live in data, will find this book comprehensible and a delight to read. He goes on to explain why this way of understanding visual perception is important. With these words, Colin begins his own elegant dance of explanation, taking the reader step by step through the process of visual perception, pointing out in practical terms along the way how this knowledge can be applied to information visualization and also other thinking processes, such as scribbling on a napkin to explore ideas. It is always tempting, when reviewing a book this good, to say too much out of sheer excitement. I’m not going to give into this temptation, because I don’t want to spoil any of the fun that you’ll have reading this book from beginning to end with little advance knowledge beyond the fact that it is an extraordinary work. Everyone interested in information visualization should read this book. Not just read it, but mark it up with lines, comments, and even diagrams in the margins, and then keep it close at hand for easy reference and review. Having just attended your workshops in Boston, I can honestly say your workshops do fall into this category! I really enjoyed all three days and learned many new things. I really liked how you engaged the audience and kept it interactive. Again, thanks for sharing your knowledge so freely with everyone. I too was privileged to attend your workshops in Boston and concur with Michael. While in Boston I was able to pick up a copy of Mr. Ware’s new book (following your recommendation). It is a fascinating read and I have already recommended it to an interface design friend of mine. I’m curious to see Mr. Ware’s previous book. Does it cover a different array of material or is it more closely related to this new book? The previous book is much more costly (particularly here in Canada) but I would like to contribute to Mr. Ware’s research in a capitalistic way if I could justify the expense. Once again, thank you for the workshops and your patience with all of my questions and comments. Don’t be surprised to see more Canadian public servants at your workshops in the future. Colin Ware’s book “Information Visualization: Perception for Design” is also excellent. It is more comprehensive and technical than “Visual Thinking for Design.” If you want to delve more deeply into visual perception and how our understanding of it can be applied to information visualization, you should definitely get a copy of this book as well.